The weekend of Saturday, October 8 I headed down to Long Island with Massacre for the Capital District Trauma Authority's bout against the New York Shock Exchange brand new B-Team: the Dow Jones Average, featuring saucy players such as everybody's favorite Jimmy Rage as well as Bane-Ana-on-Skates, or as Wellen's mom put it, "Oh that 1B player - he's so out of control - he's dangerous!" In only the voice a mother could have when a scruffy lad is beating up on her seven-foot-tall son's teammates. NYSE took the lead early in the game with a 29 point jam by Starsky. I should back up and state that NYSE, as a League, has been a dominant force in men's derby for years. This bout was to be a learning experience for CDTA. And to be fair, there were a few A (B+?) players on NYSE's roster. Let me get some numbers out of the way: the final score was 194-91, and Roarshock scored 49 of those points and was voted MVP. 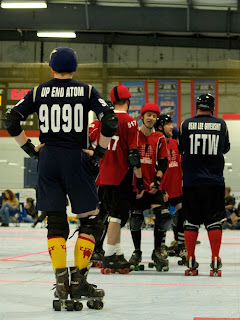 All of CDTA's jammers had to fight hard for their points, though - Roarshock, Jonny Malice, and Up End Atom faced solid and disciplined walls from the Dow Jones. 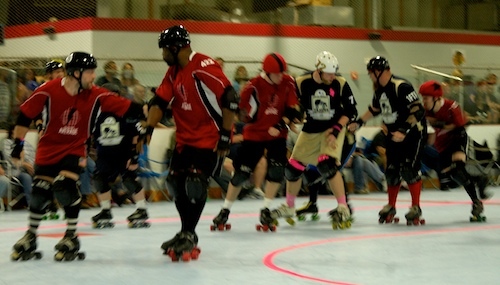 Meanwhile, CDTA's blockers faced some of the craziest jammers in the northeast. In my typical sunshine and rainbows bout recap fashion, I am going to hand select a few instances in which I caught some nice teamwork by CDTA. Wellen, Bear, and what looks like a third CDTA player in the back hold back Jimmy Rage. I like this next photo series. 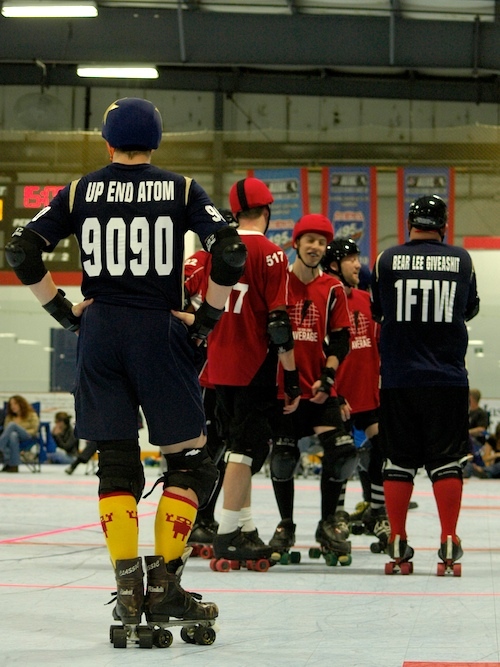 Hazmatt, one of the newest players on CDTA starts with a nice booty block, and Wellen sees the opportunity to partner up and hit the jammer from the side. 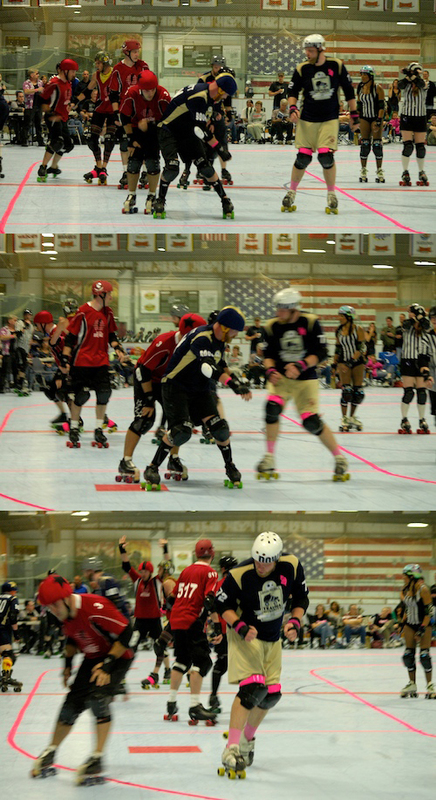 In the last frame, you can see he hits out the jammer. But I don't know what happened to Hazmatt? Anyway, good team work! The ol' 1-2-3 CDTA proverbial punch. This bout was pretty brutal for CDTA, but in retrospect they now know more about what the need to work on. I gotta say, the dudes from the Shock Exchange are so very, very nice and so willing to talk about derby and give advice - there was a lot of chatting after the bout between the two teams. 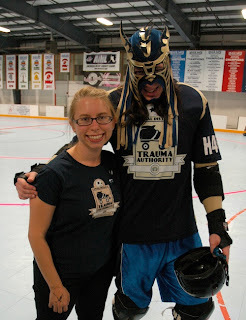 Other bout recaps: NYSE and CDTA. ANYWAY - the other sweet part of the weekend was that we got to stay overnight with Massacre's sister and her husband in NYC. On Sunday we went to the Bronx Zoo which was awesome! 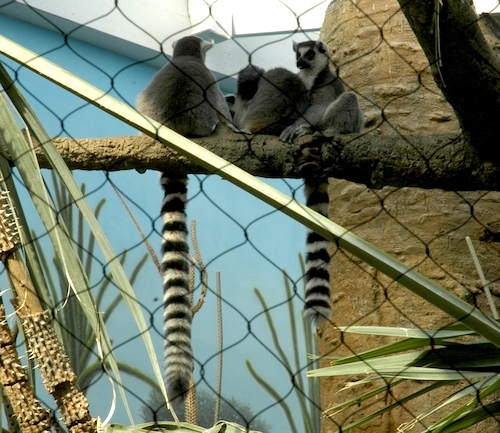 I got to see one of my favorite animals: lemurs!! So, I will end this post with one more picture of some of my favorite handsome animals.